Virgo is a giant laser interferometer designed to detect gravitational waves. Virgo has been designed and built by a collaboration between the French Centre National de la Recherche Scientifique (CNRS) and the Italian Istituto Nazionale di Fisica Nucleare (INFN). 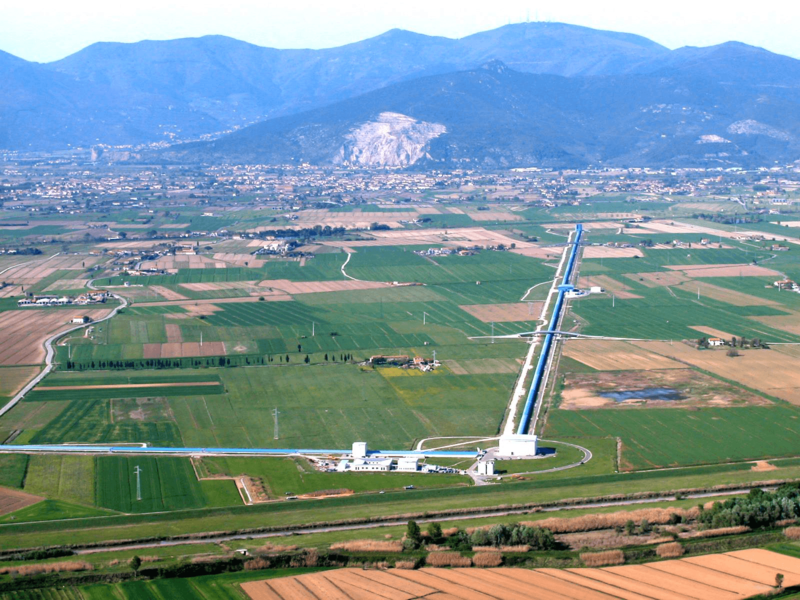 It is now operated and improved in Cascina, a small town near Pisa on the site of the European Gravitational Observatory (EGO), by an international collaboration of scientists from France, Italy, the Netherlands, Poland, and Hungary. Aerial view of Virgo, looking north (Credits: The Virgo Collaboration). Gravitational waves are a consequence of the theory of General Relativity, published by Albert Einstein in 1916. They are ripples in the fabric of the spacetime that propagate at the speed of light, and are produced when huge masses are accelerated or deformed. This happens in many astrophysical scenarios, including supernova explosions or the gravitational interactions between black holes or neutron stars. Gravitational waves are completely different from light, the main “messenger” used so far to study the Universe, although nowadays scientists have started to exploit other cosmic messengers, like cosmic rays or neutrinos. With the first detection of gravitational waves in September 2015, a new window on the Universe has been opened, allowing us to probe extreme phenomena driven by gravity. All the scenarios that will be probed by gravitational waves are so extreme that they are impossible to reproduce in our laboratories. However, detecting gravitational waves is no easy task. More than fifty years of experimental and technology developments carried by thousands of scientists worldwide were needed to finally see the first gravitational waves with ground interferometers in 2015. Why is so difficult to catch gravitational waves? They travel through spacetime, deforming it and producing mini “spacetime quakes”. In this slightly warped spacetime, material bodies are strained, and distances are stretched and squeezed alternatively. That’s a very tiny effect though: when a gravitational wave crosses Virgo, the 3-km arms of the detector are stretched by only a billionth of a billionth of a meter, i.e. less than a thousandth of the diameter of a proton. A very tiny effect that witnesses a violent astrophysical event thousands of light years from us! The initial Virgo detector observed the sky between 2007 and 2011 together with the two interferometers of the Laser Interferometer Gravitational Observatory (LIGO), located in the United States in Hanford, WA, and Livingstone, LA. At present, both Virgo and LIGO interferometers are undergoing a major upgrade after a long shutdown period. This upgrade will push all the employed technologies to the limit and improve the sensitivity of Virgo by a factor of ten. Search for gravitational waves has restarted in 2015 using the two improved Advanced LIGO detectors, with a much better sensivity than the previous generation of detectors. The improved Advanced Virgo detector will be back online in the network end of 2016.